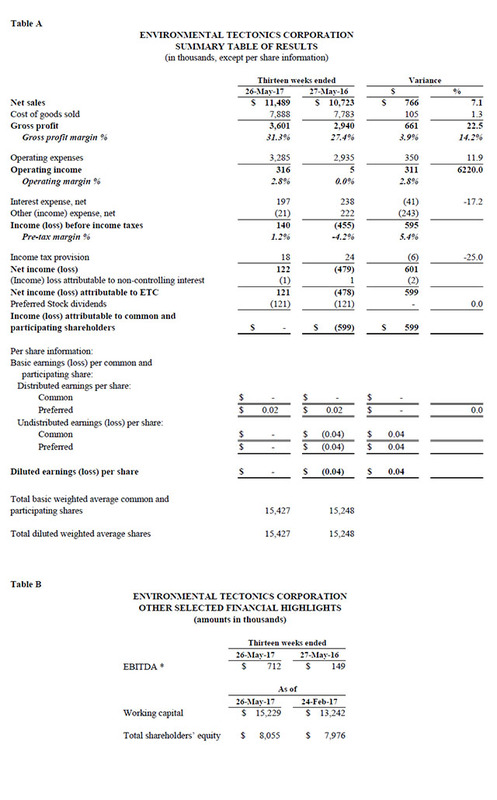 Net income attributable to ETC was $0.1 million, or $0.00 diluted earnings per share, in the 2018 first quarter, compared to a net loss attributable to ETC of $0.5 million during the 2017 first quarter, equating to $0.04 diluted loss per share. The $0.6 million variance is due to the combined effect of a $0.7 million increase in gross profit, a $0.2 million favorable variance in other (income) expense, net, and a $41 thousand decrease in interest expense, offset, in part, by a $0.4 million increase in operating expenses. Net sales in the 2018 first quarter were $11.5 million, an increase of $0.8 million, or 7.1%, compared to 2017 first quarter net sales of $10.7 million. The increase reflects higher sales of Environmental Testing and Simulation Systems within our CIS segment and higher sales related to ATS products within our Aerospace segment to Domestic customers, offset, in part, by a decrease in sales related to ATS products within our Aerospace segment to International customers and an overall decrease in sales of monoplace chambers within the Hyperbaric Chambers business unit of our CIS segment. type products requiring less initial design and engineering work. Operating expenses, including sales and marketing, general and administrative, and research and development, for the 2018 first quarter were $3.3 million, an increase of $0.4 million, or 11.9%, compared to $2.9 million for the 2017 first quarter. The most significant component of which was the non-cash expense associated with the issuance of Common Stock awards. Other income, net for the 2018 first quarter was $21 thousand compared to $0.2 million of other expense, net in the 2017 first quarter, a variance of $0.2 million due to the combination of a net realized foreign currency exchange gain in the 2018 first quarter compared to a net realized foreign currency exchange loss in the 2017 first quarter and a decrease in letter of credit fees. During the 2018 first quarter, as a result of an increase in costs and estimated earnings in excess of billings on uncompleted long-term contracts and an increase in accounts receivable, offset, in part by an increase in billings in excess of costs and estimated earnings on uncompleted long-term contracts and an increase in accounts payable, the Company used $1.4 million of cash for operating activities compared to $0.2 million of cash provided by operating activities during the 2017 first quarter. Under percentage-of-completion (“POC”) revenue recognition, these accounts represent the timing differences of spending on production activities versus the billing and collecting of customer payments. Cash used for investing activities primarily relates to funds used for capital expenditures of equipment and software development. The Company’s investing activities used $0.2 million in both the 2018 first quarter and the 2017 first quarter. The Company’s financing activities provided $1.6 million of cash in the 2018 first quarter from borrowings under the Company’s various lines of credit. In the 2017 first quarter, the Company’s financing activities used $0.3 million of cash on repayments under the Company’s various lines of credit, offset in part, by a decrease in restricted cash. ETC was incorporated in 1969 in Pennsylvania. For over four decades, we have provided our customers with products, services, and support. Innovation, continuous technological improvement and enhancement, and product quality are core values that are critical to our success. We are a significant supplier and innovator in the following areas: (i) software driven products and services used to create and monitor the physiological effects of flight, including high performance jet tactical flight simulation, upset recovery and spatial disorientation, and both suborbital and orbital commercial human spaceflight, collectively, Aircrew Training Systems (“ATS”); (ii) altitude (hypobaric) chambers; (iii) hyperbaric chambers for multiple persons (multiplace chambers); (iv) Advanced Disaster Management Simulators (“ADMS”); (v) steam and gas (ethylene oxide) sterilizers; (vi) environmental testing and simulation devices; and (vii) hyperbaric (100% oxygen) chambers for one person (monoplace chambers). We operate in two primary business segments, Aerospace Solutions (“Aerospace”) and Commercial/ Industrial Systems (“CIS”). Aerospace encompasses the design, manufacture, and sale of: (i) ATS products; (ii) altitude (hypobaric) chambers; (iii) hyperbaric chambers for multiple persons (multiplace chambers); and (iv) ADMS, as well as integrated logistics support (“ILS”) for customers who purchase these products or similar products manufactured by other parties. These products and services provide customers with an offering of comprehensive solutions for improved readiness and reduced operational costs. Sales of our Aerospace products are made principally to U.S. and foreign government agencies and to civil aviation organizations. CIS encompasses the design, manufacture, and sale of: (i) steam and gas (ethylene oxide) sterilizers; (ii) environmental testing and simulation devices; and (iii) hyperbaric (100% oxygen) chambers for one person (monoplace chambers), as well as parts and service support for customers who purchase these products or similar products manufactured by other parties. Sales of our CIS products are made principally to the healthcare, pharmaceutical, and automotive industries. We presently have two operating subsidiaries. ETC-PZL Aerospace Industries Sp. z o.o. (“ETC-PZL”), our 95%-owned subsidiary in Warsaw, Poland, manufactures certain simulators and provides software to support products manufactured domestically within our Aerospace segment. Environmental Tectonics Corporation (Europe) Limited (“ETC-Europe”), our 99%-owned subsidiary, which we are winding down, functioned as a sales office in the United Kingdom. ETC’s unique ability to offer complete systems, designed and produced to high technical standards, sets it apart from its competition. ETC is headquartered in Southampton, PA. For more information about ETC, visit http://www.etcusa.com/. * In addition to disclosing financial results that are determined in accordance with accounting principles generally accepted in the United States of America (“U.S. GAAP”), we also disclose Earnings Before Income Taxes, Depreciation, and Amortization (“EBITDA”). The presentation of a non-U.S. GAAP financial measure such as EBITDA is intended to enhance the usefulness of financial information by providing a measure that management uses internally to evaluate our expenses and operating performance and factors into several of our financial covenant calculations. A reader may find this item important in evaluating our performance. Management compensates for the limitations of using non-U.S. GAAP financial measures by using them only to supplement our U.S. GAAP results to provide a more complete understanding of the factors and trends affecting our business.